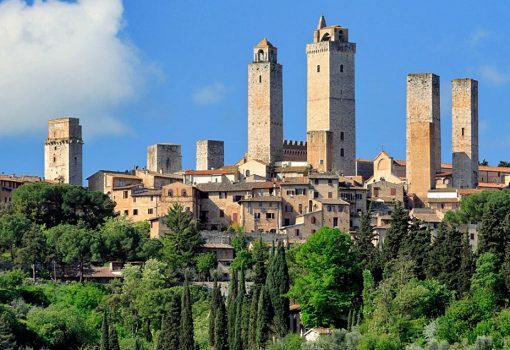 Visiting San Gimignano on foot is the best way to learn about its history. Known throughout the world for its unique urban structure that dates back to the thirteenth and fourteenth centuries. This excursion to San Gimignano offers visitors the chance to visit its soul with its medieval history, art and local flavors. Passing through the main streets and small alleys, normally hidden visiting the Town Hall and the Art Gallery you can observe the city under a unique point of view. Going up the Torre Grossa you will enjoy a beautiful view of the surrounding countryside. The medieval towers and Romanesque churches, which seem to emerge everywhere, bear witness to the unique character of this city, from the soul and Senese Fiorentino. Established on a crossroads between Via Francigena and the ancient Roman trade routes, San Gimignano was the crossroads of the routes of the main Italian and European merchants who traded wine and saffron. Having fulfilled the mind and spirit, having observed and experienced the true essence of the city, you will also satisfy the taste buds with a tasting of the famous Vernaccia di San Gimignano and the renowned Chianti Colli Senesi naturally all accompanied by local products such as salami finocchiona or Tuscan, Tuscan ham, pecorino cheese and bruschetta with extra virgin olive oil. Throughout the journey you will be accompanied by an expert guide who will explain the history, art and culture of the city. For more information visit the MyFlorenceTours website or call us at (+39) 055-713655. You may also be interested in: Siena and San Gimignano Full Day Tour, Secret Siena Tour.